As one of the highest grossing franchises of all time , fans of the movie Captain America: Civil War were ecstatic to see again on big screen the set of marvel superheroes. It stars Hollywood a-listers Robert Downey Jr., Chris Evans, Scarlett Johansson, Sebastian Stan, Chris Pratt, and Jeremy Renner. There were also Anthony Mackie, Don Cheadle, Chadwick Boseman, Paul Bettany, Paul Rudd, Emily Vancamp, Elizabeth Olsen, Tom Holland, Frank Grillo, William Hurt and Daniel Bruhl. It premiered in Los Angeles last April 12 and was seen in our country last April 27. The plot of the movie was about the disagreements between the heroes where Iron Man favors the regulation of the government with avengers while Captain America wants them to have freedom in protecting people. Because of their situation, the avengers became divided between Team Captain America vs. Team Ironman. 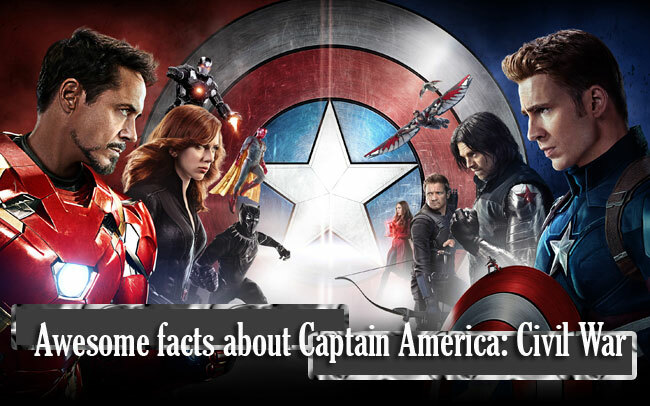 Here are the 15 facts about the movie if you haven’t seen it yet. 1. Scarlett Witch played by Elizabeth Olsen has a new leather suit where she can mobilize more. 2. Hawkeye got a light left-handed bow and he is now wearing full-sleeved jacket unlike his vest on the previous films. 3. Antman’s outfit is now altered and modernized. 4. Falcon’s suit is now more sleek. 5. Paul Betanny who plays as Vision used an Airboard when floating around. 6. We will meet Black Panther played by Chadwick Boseman were he is seen wearing a suit design with African elements. 8. The fight scene at the airport between Team Iron Man and Team Captain America was the toughest to shoot and it took them almost a year to finish it . 9. The directors were inspired by psychological films like The Godfather and Fargo. 10. Excpect Civil War to have some humorous scenes. 11. Anthony Mackie and Sebastian Stan has a great working relationship and it brought on set. 12. Chris Evans revealed that Robert Downey Jr. keeps him humble cause aside from being a great actor, he is also a great writer. 13. Chris Evans wants to fly if he will be given a chance to have a superpower. 14. Anthony Mackie meanwhile wants to have a power on understanding women. As of this typing, Captain America: Civil War now has a global gross of more than $200 million and most of the critics said that it is the best avenger movie for the franchise.